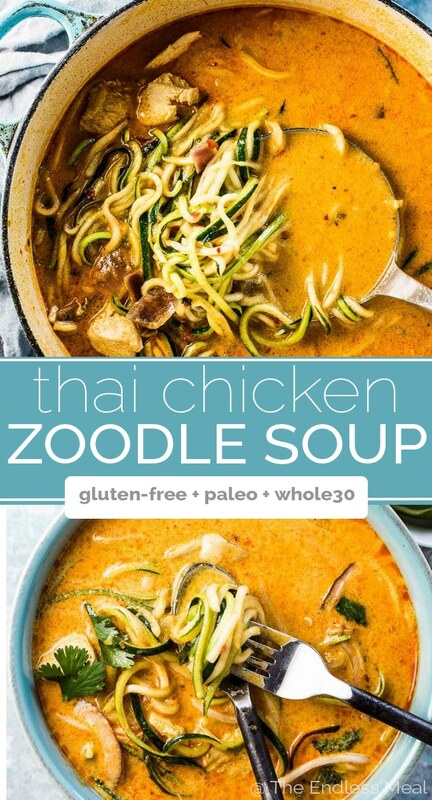 Thai Chicken Zoodle Soup is crazy flavorful and loaded with good for you ingredients like coconut milk, chicken, and lots of zucchini. This simple recipe can be whipped up in 20 minutes for a quick and easy weeknight meal. Calling all soup lovers! I have a summer soup recipe that you are going to love love love. Chicken breasts are simmered in a super flavorful creamy coconut and Thai red curry soup broth until they're tender and juicy. Just before you serve the soup, pop in some zucchini noodles and let them cook until they're fork twirl-able. This crazy DELICIOUS Thai chicken zoodle soup tastes light, fresh, and perfect for summer. Get your Thai Chicken Zoodle Soup on! With a few ingredients that you prob have on hand and 20 minutes of your time, you can dig into this pot of Thai chicken zoodle soup. That's right, my friends, you can be eating this in less time than it takes to figure out what the heck you're going to order for your local Thai delivery joint. 1. Cook the curry paste and spices in some coconut oil. Easy! 2. Add (almost) all of the remaining ingredients to the pot and simmer for 15 mins. Super easy! 3. 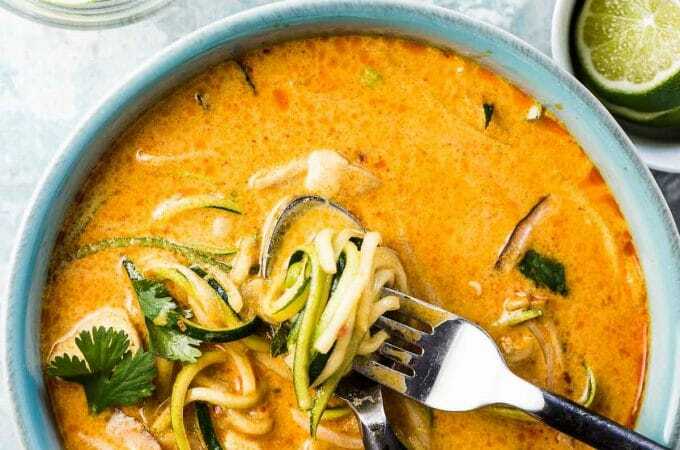 While your soup is simmering, spiralize or cut your zucchini then add it and some coconut milk to the pot 2 minutes before you're ready to eat. 4. Eat your heart out! Tell me, friends, what are your thoughts on zoodles? Or do you call them zucchini noodles? I swap back and forth but opt for the noodle version a little more often. I'm a big-time fan of zoodles. I love the way they twirl around my fork and make me feel like I'm eating noodles. And I also love that I feel great after eating them. There's no heavy, over-full, food coma thing going on after a bowl of zoodles. They're what make this Thai chicken soup feel so summery. Regular noodles feel pretty heavy. Zoodles keep this soup light and fresh. 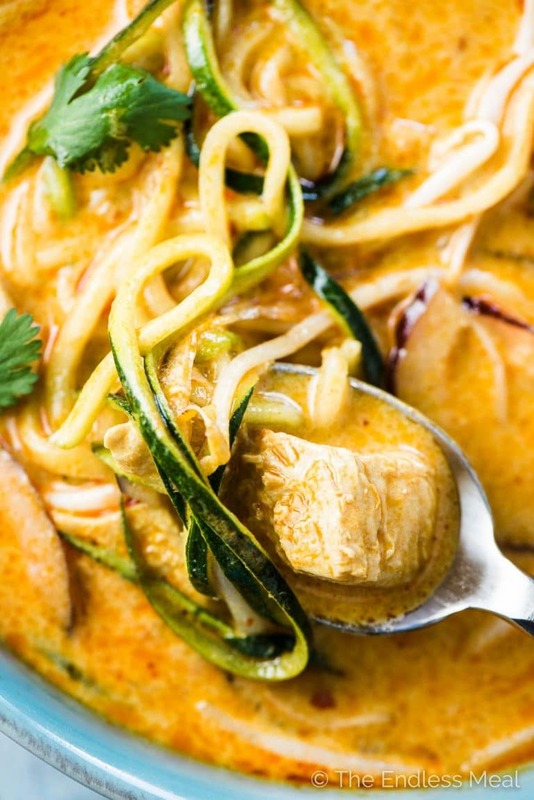 Coconut Thai Chicken Zoodle Soup is crazy flavorful and loaded with good for you ingredients like coconut milk, chicken, and lots of zucchini. This simple recipe can be whipped up in 20 minutes for a quick and easy weeknight meal. Add the coconut oil and red Thai curry paste to a medium-sized pot over medium-high heat. Let the curry paste cook for 2 minutes then add the coriander and turmeric and cook for 1 minute more. Add the chicken, chicken stock, fish sauce, honey, and red onion and bring the pot to a boil. Reduce the heat and simmer for 15 minutes. Add the coconut milk and heat through. Add the zucchini to the pot and let it cook for 2 minutes, or until it is soft enough to twirl around a fork. Serve immediately and (if using) top with the optional toppings. So good! And easy to make. I’m so happy to hear you like the soup! This soup was delicious and so easy! I didn’t have any zucchini so I substituted with butternut squash noodles. Yum. What a great sub! So happy you enjoyed it! SOOOOO GOOD! I want to like zoodles because I know they are a healthy alternative, but it’s always just felt like I was trying too hard. Until now. The curry, chicken stock, cilantro, and coconut flavor in this soup complement the zucchini incredibly well, I was thinking about it for hours afterward. It’s just right. I’m definitely making this again and again. BONUS? My husband loved it as well. Wow that is such a great compliment! I’m so so happy to hear you like the recipe and that it was a hit with your man too! I have made many Pinterest recipes and I find that most tend to be ok and I was won over by a pretty picture . However this recipe was hands down the best I have made of the many items I have pinned and tried. It was insanely easy, even more so since I had already made shredded chicken earlier in the week. It was light and flavorful, my husband who typically isn’t an Asian food fan said it was delicious. I added some red chili paste which was awesome and contained the fish sauce that I didn’t have. I will 100% make this again !!! That is such a big compliment! Thank you so much!! Sweetened or unsweetened coconut milk? The recipe doesn’t specify. Seems like that would make a big difference in the final outcome? This was an excellent recipe! I didn’t have the zucchini so I added cauliflower and carrots to the soup and served over rice noodles. This is a recipe I will use over and over again. thanks so much! Ok I need to be honest, while this was cooking, I feared I wasn’t going to like it, I did not like the way it smelled(I’m guessing it was the fish sauce). However, it has wonderful flavor and I loved it! I made it in the InstanPot and I used 4 chicken thighs instead of the breast. Will add more red curry paste next time for a bit more heat. Thanks for the recipe! Fish sauce is pretty smelly, isn’t it! So happy you liked the recipe!! Just made this and it was delicious! I used curry powder instead of turmeric because I was out. I’ll definitely make again! Can I use yellow curry paste instead of red since I don’t have it in hand. If yes same measurement or change of quantity. What do you think about substituting butternut squash for the zoodles? I subbed shrimp and shrimp stock for the chicken/chicken stock, and it was delish!! Trying to understand the nutrional info for this recipe. Where are all those carbs, sodium and fat coming from? Would you consider this a good recipe for someone who is trying to lose some weight? I reviewed the nutritional info and it looks like there was an error in the chicken stock which added 17 grams of carbs that shouldn’t have been there! The fat comes primarily from the coconut milk, oil, and chicken. The sodium is mostly from the fish sauce – 4240mg for the recipe. And the carbs come mostly from the coconut milk and honey. This is a really healthy recipe filled with whole foods, veggies, and protein and I always feel great after I eat it! Do we need to use fish sauce? This was delicious! I added an extra Tbsp of curry paste for more flavor. I will make this again for sure. Amazing flavors! Definitely a keeper. I added one Asian eggplant and 6oz of cremini mushrooms, quartered. Excellent! Good call on the eggplant and mushrooms! How well would this freeze and reheat? I haven’t tried freezing it but I would be concerned about the zoodles not holding up well. You can definitely make the rest of the soup then add the zoodles in when you’re ready to eat it! I made this the other night but used massaman curry paste instead so it wouldn’t be too spicy. It was a crazy hit! My kids devoured it and my hubby couldn’t stop saying how yummy it was! We had enough liquid left to add another zucchini and finish it off for leftovers the next day. Definitely will be making again! I’m so happy it was a hit! Hooray!! This soup is so good! Simple to make but so flavorful. Thank you for making my Whole30 a lot more delicious! You’re so welcome! Congrats on your Whole30 adventure!! This soup was delicious. I doubled the recipe & added little extra of the seasonings & squeezed 1/2 lime into pot at the end. Perfect summer meal. My family loved it. I’m so happy to hear you loved the soup!! It’s all the things I love, too!! What a mélange! Red curry, coriander, fish sauce, honey, coconut milk … I can only imagine!